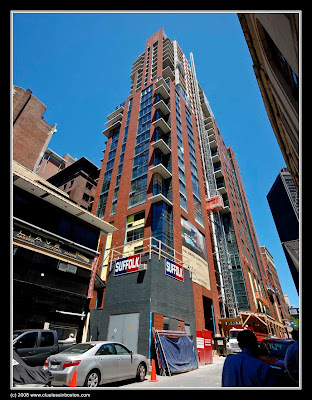 Update of the progress on the construction of a new luxe building at 45 Province Street. What angle. I think we need some information about the lens you used to do this. Hi and thanks for stopping by. This picture was made with a wide angle zoom lens (10-20mm) set at 13mm. The aperture was F11 at 1/125 sec. I like construction progress photos ... which reminds me I need to update a series I'm working on. ust remeinded me to about updating a swimming pool projct I shoul ve working on. I do love an upwards shot, especialy against those rich blue skies you have there.